We are only a month away from one of our all-time favorite things to do on our charters. 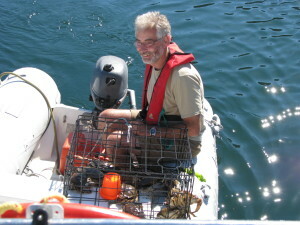 That is to throw out the crab pot when we drop anchor and drag it back up the next day when we weigh anchor. 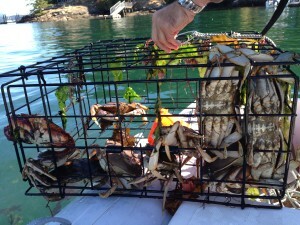 If we are lucky, we are rewarded with a catch of Dungeness crab, and hopefully up to five nice, legal males. The nice thing about crabbing is that it requires no actual talent, and does not require you to wake at an ungodly hour in the morning or brave the elements outdoors on a particularly unpleasant day. Almost like shooting fish in the proverbial barrel – almost. 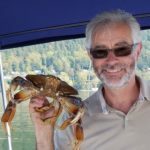 Crabbing in area 7 (encompassing the San Juan Islands and Bellingham) officially begins on July 15th and runs through the end of September. 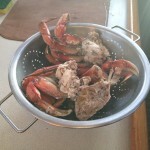 Before starting there are a few rules to follow: Make sure the crabs are legal-size. For Dungeness crab, that means the crabs must males, and must be at least 6¼ inches at the widest point of the shell, just in front of the rearmost points or tips. The most accurate way to measure is by using a plastic caliper crab gauge, available at most sporting-goods stores. Gear includes a crab trap, around 100 feet of weighted line, and a float with your contact information displayed. And don’t forget bait! We’ve found that fish carcasses (available at many sport-related stores) work well, while other people swear by chicken or turkey parts. Make sure you acquire a license and catch-record card, and fill out your catch card immediately before you forget. Don’t overlook the mandatory use of a biodegradable rot to secure a pot’s lid and escape hatches. This cord must be able to rot away to allow crabs to escape if a pot is lost. Should you lose your pot on the bottom without a proper escape cord, it can attract and kill crabs for years. Some of our favorite spots include Fossil Bay and Echo bay at Sucia Island, Prevost Harbor at Stuart Island, Friday Harbor and Garrison Bay. Chuckanut Bay outside of Bellingham has also proven to be a nice spot to drop the trap. 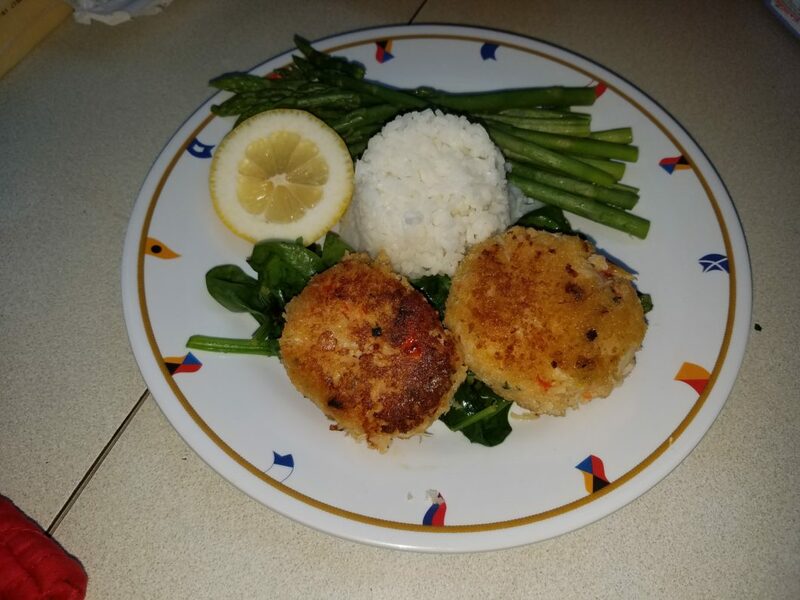 I personally love making crab cakes. 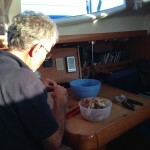 This is a labor of love, as each crab, once cooked, can take up to 20 minutes each to de-shell. I won’t include my secret recipe here, but once you have mixed all your ingredients (egg is mandatory) simply shape the mix into cakes and fry in oil in a shallow fry pan until golden. They can also be easily frozen and thawed for latter and will retail their goodness even after freezing!